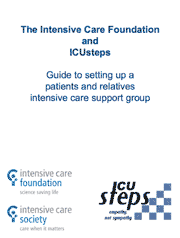 ICUsteps and the Intensive Care Society have now published a joint guideline on setting up patient and relative intensive care support groups. Since 2012, we’ve been working with the Intensive Care Society’s patients and relative committee to produce a joint guideline to advise healthcare professionals on how to set up support groups for ex-intensive care patients and their relatives. The core of the guidance surrounds The Five Step Plan which provides a checklist of items that you’ll need to consider in order to establish a support group. Central to the approach is establishing a core group of healthcare professionals, ex-patients and relatives who bond and form a partnership to become the care-givers to more recent patients and relatives who attend the support group's drop in events. The guideline also includes steps around defining a group structure, agreeing your support method, funding and the practicalities of arranging a drop in. The guide is available for download and if you have any questions we'd be happy for you to contact us. We have a growing number of support groups around the country holding regular meetings for patients and relatives to meet with others who really understand what they've been through. Could you set up a support group? 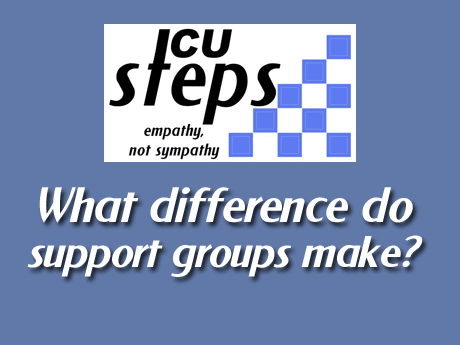 If you work in critical care and would like to know more about setting up a support group in your area, view the Nursing in Critical Care article by ICUsteps trustees Mo Peskett and Peter Gibb on Developing and setting up a patient and relatives intensive care support group. We're keen to see more support groups form and want to help, so please contact us. Tracey from our Newport group has written an account of her experiences of the first twelve months in the life of a new patient support group. Read her story on how she and her group got on in their first year.